Did you know that it is 5-10x harder to acquire a new customer than it is to sell to an existing one? In fact, according to the Gartner Group, customer loyalty is important – 80% of your sales will come from just 20% of your existing customers. So – while getting new customers are important, if you have a list, creating a simple loyalty program is a great start and not that hard to accomplish! This idea appeals to marketers at small retailers. In a recent Mindful Marketing Discovery Blueprint conversation with a Toronto retailer, he said: “I like the club approach – where you are thinking of people not just as a customer, but as a partner.” Small business people, especially in the millennial generation, understand intuitively that brands should be more than just transactional. When you think of Loyalty, what first comes to mind is Airmiles or Costco. But, it is not only major brands who can create loyalty. In fact, sometimes being a smaller retailer has more cachet, and makes the community more tight knit. Indie Toronto retailer Get Outside Shoes has an attention-getting program in terms of building an insider’s club. The retailer of Vans, Toms and Puma has a location smack dab in the middle of Toronto’s trendy Queen West area. When you click you see that you will get a 10% promo code on your next purchase, and you will also get a birthday gift! Plus, you get to hear about the latest sales and products. A great tip is to create irresistibleble offer for your audience! 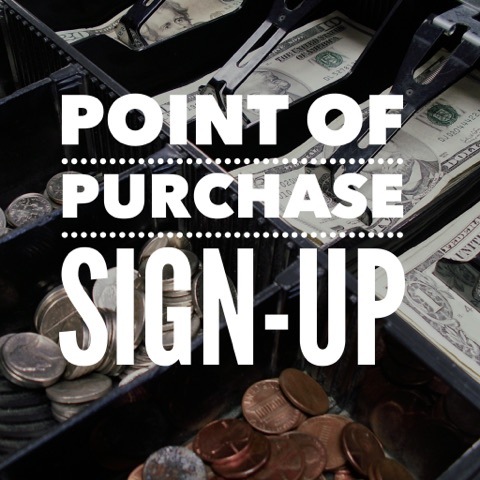 Retailers can also get e-mail information at the cash register when the customer is checking out – letting them know about the 10%-off program. To begin, you could even print some basic cards outlining the benefits. This not only helps you build your list, but it also helps you create a great first impression for new customers as well. If you want to create an even simpler offline solution you can try out what delish-bakery-of-carb-goodness retailer, Cobs Bread, does: if you purchase 14 large loafs, you get one for free. This is a common approach, and if you look at your wallet, you will probably find more than one loyalty program card in there. Other loyalty programs will give you a little, branded plastic piece that you can put on your keychain. What a constant reminder that you are in “the club”! For the card below, you will notice that there is some subtle branding here – a bakery, which offers up healthy baked goods, has coloring programs for kids, and does a lot of outreach (full disclosure, they personally sponsored one of my SickKids fundraisers). 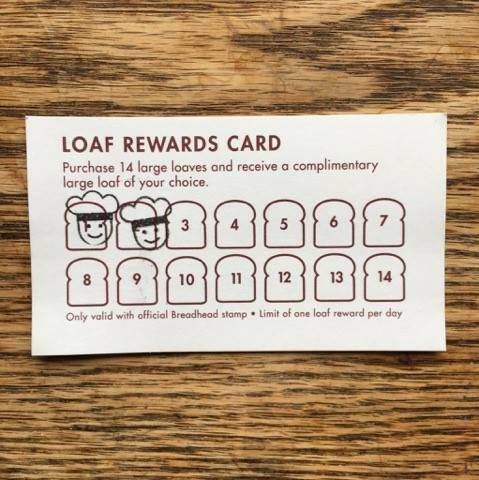 So – the playful, helpful-to-the-family brand is carried through with the “Bread Head” stamps showing a sweet happy face. This would be completely off-brand for Indie Get-Outside shoes, but just right for Cobs. As part of your Loyalty program, you will want to send out a regular newsletter. This newsletter should include samples, freebies, and offers. 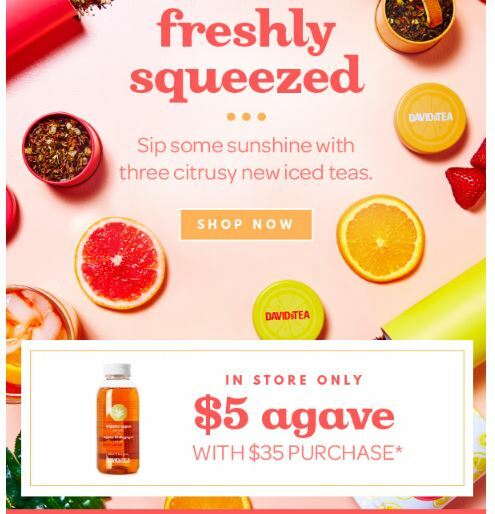 In a recent e-mail that I received from David’s Tea, they evoke the refreshing feeling you get from the summer teas and also call you back to the store with an offer. This is obviously one of the goals of their loyalty program – to bring more foot traffic. Other times, they focus on online goals. Increase repeat sales by 20% by 30 June 2018. Increase customer loyalty by 25% by 30 June 2018 using a customer rewards program. Increase online sales on our deals page by 25% YOY for September 2018. Increase in-store sales by 10% YOY for 2018. Finally, you can brand your loyalty program. Just as the subtle branding is different for Get-Outside Shoes (being an Indie retailer) vs. Cobs Bread (a nice choice for kids) vs. David’s Tea (we are unique and fun) resonates with different customer bases, your loyalty brand will resonate with yours as well! Here are some basic questions to get you started. Where does your target market like to shop or go online? 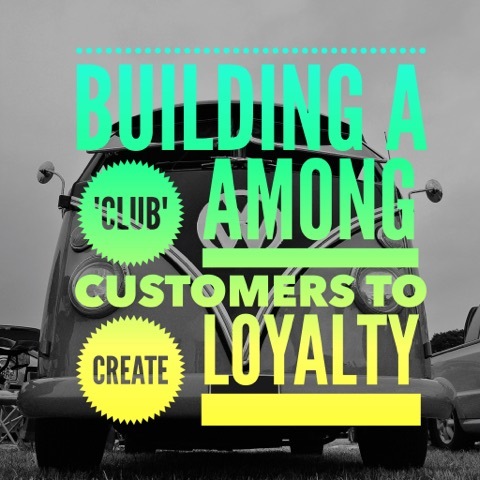 In my next post in this series, I will talk about how to bring your loyalty program to the next level! Would you like to set up your own Mindful Marketing Discovery Blueprint? It costs nothing to do, and it can create huge value for you. It includes a questionnaire, a 1:1 meeting with me and a full report. Normally this would cost hundreds of dollars, but for a limited time, I am offering it up for free.